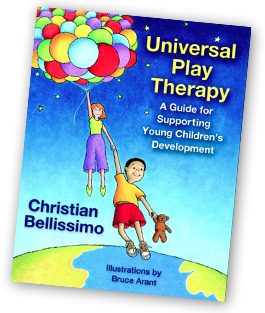 I sold my first copy of Universal Play Therapy to Canada recently. The first thing I did was Google the address, and open up the map to see where the buyer was. It was a town in Ontario, north of Minnesota. I did it impulsively, and I quickly realized why. I looked up Canada in the encyclopedia countless times as a child. I’d look at the pictures of cities, majestic lakes, snow capped mountains, and I’d study the names of the towns. Growing up, I obsessed over ice hockey. I dreamed of living in Canada, in the land of Gretzky. I cut out pictures of Number 99 and taped them to my bedroom wall. I even shared his birthday. In the winter, I’d leave the garden hose running for days in an attempt to create a backyard rink. The New Jersey ground never froze enough, and much to my disappointment, the water merely saturated the ground. Sorry about the water bills, dad. Oh, well, the family swimming pool would just have to do. Me and my younger brother would sit on the diving board, lace up our skates, and play for hours. We even fell through a few times. The rest of the year, my brother, always my partner in crime, would put on catcher’s equipment and we’d play hockey in THE LIVING ROOM, a ball of tin foil substituted for a puck. We didn’t want to break anything. Where was the adult s upervision? You might be wondering. At the time, my mom was deceased, and my dad was in the hospital for months at a time, or somehow managing the strength to work as a dentist and oral surgeon despite a terminal and chronic illness. I suppose my brother and I could have been doing much worse with our spare time. 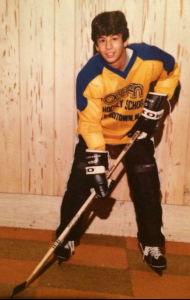 I never became a professional hockey player, of course. And I haven’t moved north of the border, yet. But I’m reminded how important it is for kids to dream. My dream of Canada led me to writing that address today at the post office, for my love for hockey kept me out of a lot of trouble. Sort of. Anyone who knows me, knows how much I enjoy drinking coffee. In addition to a Pavlovian response to the smell and taste, when it comes to work, I’ve learned that I’m not very productive in the confines of my home. Thus, I often spend my free afternoons writing reports and blogs, emailing clients, or creating a power point for my next workshop. 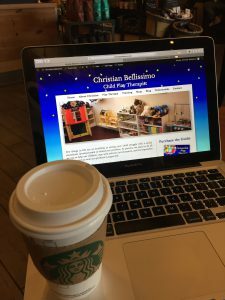 In fact, Universal Play Therapy, from start to finish, was written over a period of three years, in a cafe, over hundreds of cups of coffee. A dad was sitting at a table in front of me with his young son. For almost an hour, not a single word was exchanged between the two. Not a moment of eye contact. Not a smile. Nothing. The child sat, iPad in hand, transfixed. Expressionless. The dad hovered over his smartphone. Tapping, typing, and swiping. Then mom arrived. She sat at the table with the dad and her son. The boy did not look up from the tablet. Mom proceeded to retrieve her phone, and the circle was complete. The socially disconnected, technologically adept family sat in silence amidst a bustling café. I grew up in a time when technology was not nearly as pervasive as today. As a young child, my involvement with video games essentially amounted to an occasional game of “Pong” on Atari. However, the technological landscape is vastly different today. Parents need to be educated about the potential consequences of excessive screen time on a young child’s immature and developing neurological system. A child’s brain is hardwired for eye contact, language, and social interaction. Denying them those experiences can have a lasting effect on virtually every area of their development. I can’t recall a single, specific game of “Pong” I played as a child. However, I do remember and cherish the memories from my own childhood. I hope what I witnessed the other day at Starbucks was an exception, rather than a rule. Otherwise, that boy is missing out on a lot. And so are his parents. One of the most difficult responsibilities of my career as a play therapist has been the heart wrenching task of telling a young child their parent has died. However, you might be surprised at my disclosing that is often the easy part! The greatest challenge for me has been working with the adult caregivers to ensure the child’s emotional growth is supported before, and after the loss. That is for two reasons: first, adults are often uncomfortable about death in relation to children. Second, there is often a lack of understanding around what, when, and how much information the child should be given. I was five years old. 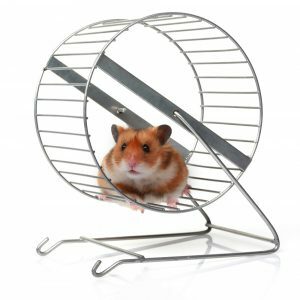 I had just gotten home from school and rushed to my bedroom to say hello to my beloved hamster, “Harry.” As I entered the room, I sensed something was wrong. It was quiet. Harry’s metal wheel, the one he loved to run on, was silent. The familiar rhythmic squeaking absent. I nervously approached his cage. I peeked inside, holding my breath. I found Harry, laying silently, in his pile of cedar shavings. My mom called from the kitchen, offering a chocolate milk. When I didn’t respond, she came looking for me. As she entered the room, what she found surprised her: Harry was on my desk, eyes closed, on his back, motionless. With one fingertip over the other, I was “performing” CPR on the small creature, trying desperately to revive him. I put Harry in a shoe box and covered him in shavings. I said a prayer. As far as I knew, my dad buried Harry in the backyard when he got home from work (wink, wink). As I reflect on the first loss of something I loved, several things occur to me: even at that young age, I understood the permanency of death. It’s irreversibility. I also had an innate spirituality. It’s a beautiful gift most children possess, but is often squandered. Acknowledge any personal feelings of discomfort about death, and our very understandable instinct to protect our children from pain and sadness. Children can be far more resilient than we realize. Recognize the child’s developmental understanding of death, and explain it in a way they will understand. A child will need to revisit the loss as they progress through the developmental continuum, and their cognitive understanding of death changes. Model appropriate and healthy expression of feelings. Children learn em otional coping skills from those who care for them. Despite the chaos that often ensues following the loss of a loved one, structure and consistency are essential to a young child’s adjustment. Every effort should be made to maintain their daily routine. Embrace the child’s sense of spirituality while encouraging its expression. There can be beauty in bearing witness to a young child’s unique honoring of their deceased loved one. If possible, get your child a pet- they help build empathy, and can be used to teach about the cycle of life, including loss. Every few months, I dream I can fly like Superman. I’m way up high, soaring through the clouds, looking down at a real life Google map, free from the constraints of my life as a mortal. The idea of possessing a super power appeals to many: to be faster than a speeding bullet… more powerful than a locomotive… able to leap tall buildings in a single bound. 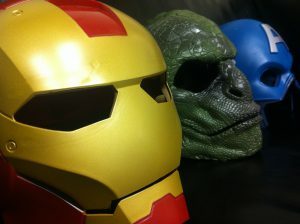 Hence the eternal success of superhero movies.